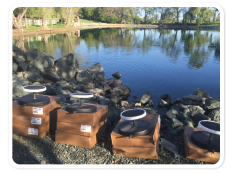 Waterworks Industries, Inc. can design an aeration system for your waterbody that will provide the precise level of aeration needed to maximize the benefits outlined below. We use state of the art equipment and the latest technological innovations to ensure that the benefits from your system will continue well into the future. Increase the dissolved oxygen content of the water in your waterbody. Increase and improve fish and other aquatic animal habitat. Eliminate or prevent summer stratification of your lake or pond. 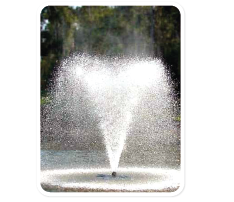 Waterworks Industries, Inc. also specializes in installing decorative floating fountains and lighting systems that can aesthetically enhance your fountains, ponds, and lakes or provide a focal centerpiece for waterbody owners and managers.